There’s no better way to ice and decorate a cake. Simply turn the table as you you ice for a smooth, perfectly covered cake. 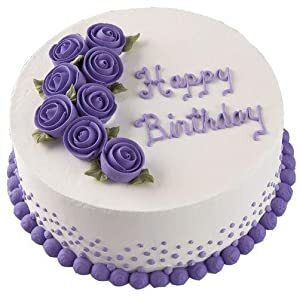 Great for both left-handed and right-handed decorators, the rotating cake stand turns smoothly clockwise and counterclockwise on a hidden ball-bearing track and also easily locks in place when desired for steady lettering and delicate flowers. The non-slip design of the 12-inch platform has a soft-grip ring molded into it to keep your cake in place. 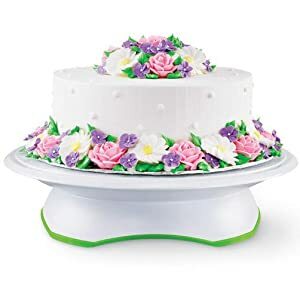 The Trim ‘n Turn Ultra Cake Turntable makes cake decorating easier in every step of the process, from leveling and torting the cake layers and icing the layered cake to combing the sides of your cake and creating detailed borders along the base and top edges and icing work along the sides. The 3-inch raised base also has a non-slip edge to keep the turntable from moving on your work surface. 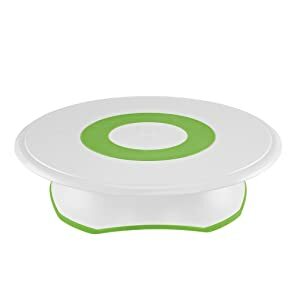 The rotating cake stand can hold a cake up to 11-inches diameter with the platform still visible and can even accommodate a larger cake on a cake board. Trim-n-Turn Ultra Cake Turntable can even be used for serving or display.